The Election process is a Preferential System modelled on the Senate Ballot Paper, but with significant differences. Therefore this candidate is the representative chosen by the State or Territories Parliament, rather than an individual parties candidate. The State or Territories’ Endorsed Primary Candidate (EPC) will take the top position on the Ballot Paper. This candidate must endorsed by a minimum of two-thirds (66.7) of votes. If the State or Territory cannot reach a consensus, that State or Territory will forfeit the right to nominate an Endorsed Primary Candidate. An X, or tick/check mark, or a 1 in the box above the line is all that is required to be a legal vote. The Parliament’s candidate always takes First Place below the line on the ballot Paper. The candidate who receives the most votes becomes that State’s representative to go to the Federal House of Representatives in Canberra. 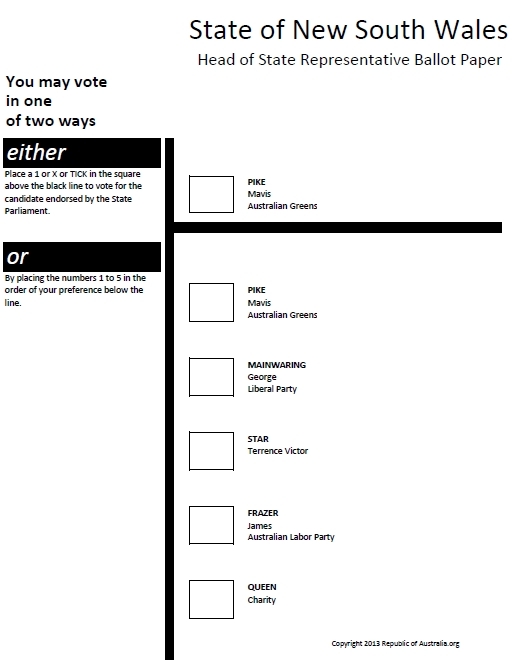 Below is a fictional ballot paper for New South Wales. In this example there are 5 candidates. The NSW Parliament’s ECP is Mavis Pike, who happens to belong to the Australian Greens Party, and is also endorsed by the Greens. As the Prime Candidate, she gets selection above the line. The Greens could stand their own independent candidate, but have decided not to. Both the Liberal Party and Labor Party have nominated candidates: Mr George Mainwaring (Lib) and James Frazer (ALP). No other political parties have nominated a candidate. There are two independent candidates nominated by the people: One is Mr TV Star, and the other Ms Charity Queen. The two mainland territories, The Australian Capital Territory and the Northern Territory will also have a ballot as per the states. The External Territories nominations would be included on the ACT Ballot paper, except for The Cocos Islands and Christmas Island which are currently recorded on the Northern Territory ballot. The residents would vote on the same Ballot Papers.